Essaycaptains.com promise to help you ‘build your career’ by writing the papers for you. I find their website to be highly professional and easy to navigate, which made writing this review an easy task. However, I encountered some issues with the company’s papers and features. Read on to find out why. The company has one of the widest ranges of services I have seen, all clearly listed in the Services page. 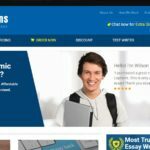 From what I could find, essaycaptains.com offers papers for all academic levels and tight deadlines. This makes for a good bargain if the company offers solid prices and good papers. If you are looking for a regular content provider, you are looking for a service that offers all the papers you need throughout your education. Unfortunately, prices here are far from cheap. A single page of an essay for graduate level with a deadline of 7 days cost $34.85 per page, which is an extremely steep price for this academic level and deadline. Of course, you can order the same paper with Standard quality level for a rate of $31.65, but this does not make for such a big difference. The prices are very steep and differ in only few dollars from one quality level to another. Since there are no discounts mentioned on the website, I thought this is not an option with the service. But, when I tried to calculate the price of my paper, I found that the calculator adds the discount automatically, making the price a bit lower. I say ‘a bit’ because the discount is ridiculously low. My paper came at a price of $32.6 with the added discount, which makes for less than 10%! This is the worst first-order discount I have seen, and does not make for a good regular content provider either. As I said, the website is of high quality, so the ordering process is also very simple. You can order your paper within minutes, all you need to do is provide the service with information about the paper and deadline. You cannot get in touch with the writer directly, but the company’s customer service is more than happy to assist at all times. This is how I kept track of my paper’s progress. The customer service agents made sure that I am constantly updated on the progress of the paper, and the writer did meet my deadline. However, the paper was not as good as I was promised. Considering that I chose the highest quality for my paper, I expected much more. My premium quality paper equaled standard, and even average quality. Therefore, if you decide to order from this company, I recommend that you avoid the cheaper quality options, since the company’s writers are not so good at crafting academic papers. Without the discounts, this company is not worth the money spent.